GREEN CLEANING, WITHOUT COMPROMISE. 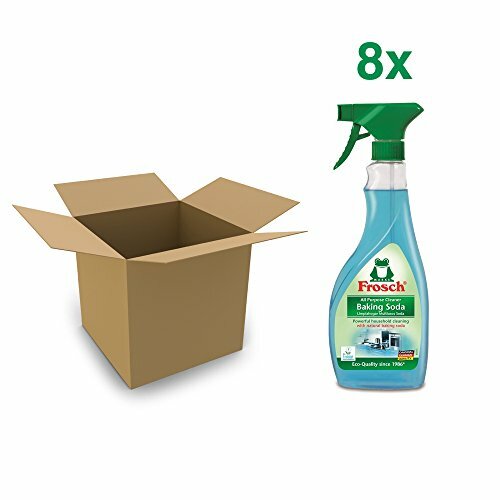 This is a case of eight, 500 ml spray bottles of Frosch Baking Soda Universal All-Purpose Cleaner. This highly effective all-purpose cleaner removes grease and dirt reliably without leaving any residue, and uses the power of natural baking soda to tackle the toughest messes. Suitable for use on most wipeable surfaces, including food preparation areas, floors, and outdoor surfaces. This cleaner is manufactured with natural baking soda, plant-based renewable surfactants, and is 100% vegan with absolutely no animal testing. Our pledge to you is that our natural formula and honest cleaning method will give you a healthier, better life through a clean home free of harsh chemicals. Frosch has been voted Germany's Most Trusted Household Cleaning Brand by Reader's Digest each year from 2001-2015. This product is EU Ecolabel Certified. GREEN CLEANING, WITHOUT COMPROMISE. Germany's most trusted household cleaning brand is available in the US! If you have any questions about this product by Frosch, contact us by completing and submitting the form below. If you are looking for a specif part number, please include it with your message. Celadon Road Lavender Eucalyptus All Purpose Cleaner Refill, 1 Gallon All Natural Enzymes and Organic Ingredients. Best for kitchens, counters and bath. ADVANAGE 20X Multi-Purpose Cleaner Green Apple 2 Pack - Manufacturer Direct - 20X is Our Newest Formula!